Temperatures are expected to soar past 90 degrees beginning Thursday, June 25, through at least next week. To ensure safety, this means trains traveling in 35-mph zones or higher will run 10 mph slower. This will affect all MAX lines and possibly cause minor service delays. At 95 degrees, WES Commuter Rail trains, which only run on weekdays, also go slower—no more than 30 mph. This can cause about 30-minute delays. 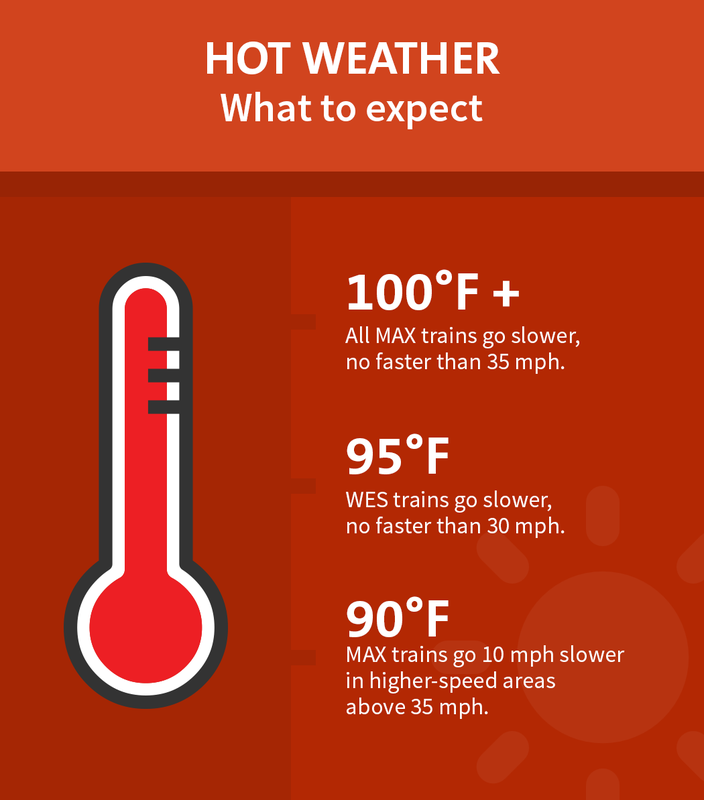 If temperatures reach 100 degrees or above, MAX trains can’t go faster than 35 mph. Expect delays of at least 15 minutes. the MAX system in two ways. First, overhead power wires may expand and sag. Second, rails could swell and bow or kink. Operators slow the trains to prevent damage to the electrical wires and rail. Learn more on how hot weather affects trains on TriMet’s blog. In addition to the air-conditioned MAX fleet, riders can keep cool aboard TriMet buses. About 99 percent of the bus fleet has air conditioning. TriMet encourages riders to stay hydrated and plan ahead. TriMet’s online trip planner makes it easy to plan a trip, with information on travel and walk times, transfers and cost. Visit trimet.org, or m.trimet.org for smartphones, and check TransitTracker for the next arrival.